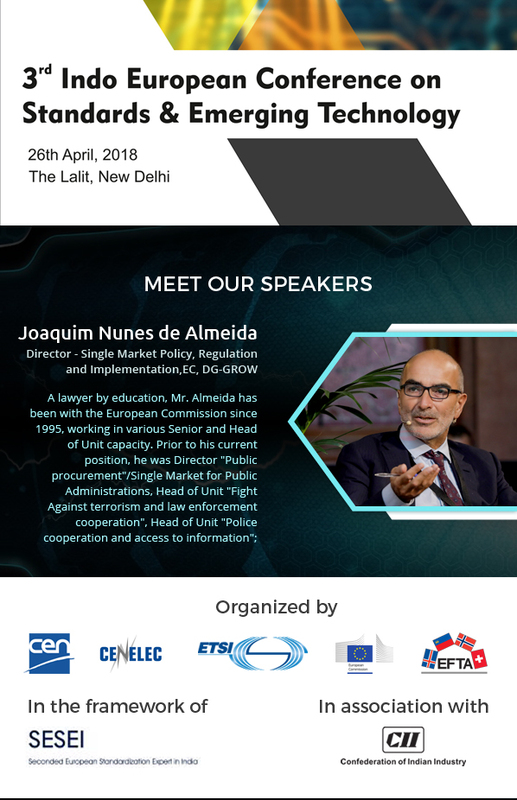 The Indo-European Conference on Standards & Emerging Technology serves as an effective platform for showcasing and presenting the most up to date developments on standards, policies and legislation around emerging technologies. 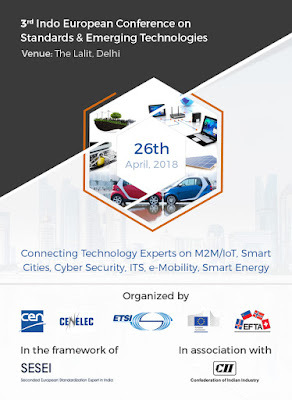 "3rd Indo- European Conference on Standards & Emerging Technology"
We would like to inform you that on 26th of April 2018, in New Delhi, India, SESEI ( Seconded European Standardization Expert for India) is organizing 3rd Indo - European Conference on Standards and Emerging Technology. In this conference Industry Experts from European Committee for Standardization (CEN), the European Committee for Electrotechnical Standardization (ECES), the European Telecommunications Standards Institute (ETSI), European Commission’s Directorate General for Internal Market, Industry and Entrepreneurship (DG GROW) and European Free Trade Association (EFTA) are participating.